Yes the title is correct we have Easter Eggs on our sliding doors. 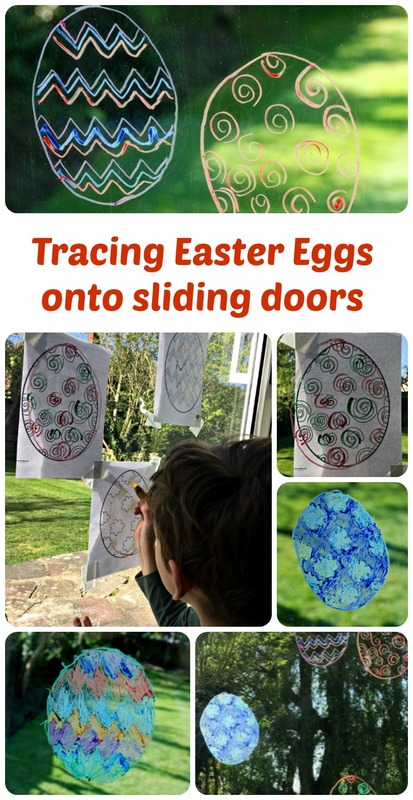 We have done a version of this activity a few times already but it is such a great activity for a number of reasons so we had another go but this time using Easter Eggs. The Easter eggs that we used are these ones – Easter Eggs Templates from Twinkl (part of their classic package). I taped a few up on the outside of our sliding doors using masking tape and then we got out our STABILO 3-in-1 pencils and some water and the kids had a go at tracing over the templates. The STABILO 3-in-1 pencils are perfect for this type of activity as they wipe off the glass very easily afterwards. And for younger children they are a nice thick shape which really helps them get their pencil grip correct. (We have used ours a LOT over the 5 years that we have had them – HUGE FANS). The main reason why I wanted to do this was from an OT angle. Our Occupational Therapist is always encouaging us to do activities where the kids are writing / drawing with their arms raised eg on a wall, as it is a way of working on their shoulder strength. One thing I must mention about this activity is you are not always going to get perfectly neat drawings. It is a fun tracing activity where the kids get to write on sliding door or windows. We never go into this with an idea that the drawings are going to be detailed and neat, there are going to be some smudges and it can be hard to trace the shapes perfectly but we make that part of the fun. Also my youngest loves wiping off the drawings and then redoing them which is REALLY good for his shoulder strength but it does tend to leave dirty streaks on the glass. For me the dirty looking streaks are not a big deal as I know he is doing a very useful activity and more importantly he is having fun while he strengthens his shoulders so I live with the dirty streaks on my sliding doors. And I leave them there for a few days as he will often come back and add to his pictures. This entry was posted in Art and Craft Ideas and tagged children's art, children's craft, easter craft, home education, homeschooling, Twinkl. Bookmark the permalink.